Inspiration Wednesday? - 1920s Paris. Whoops! I forgot to post yesterday throughout my somewhat crazy day! So here it is today, a day late, but still inspiring! 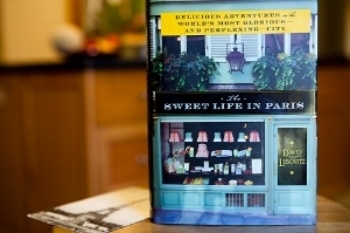 After reading Z, the Novel of Zelda Fitzgerald by Therese Anne Fowler, The Paris Wife by Paula McLain, and The Sweet Life in Paris by David Lebovitz in the past few months, my love for Paris is only growing and growing. The first two novels are set in 1920s Paris during the peak of Fitzgerald, Hemingway, Picasso, Gertrude Stein and of course lots and lots of alcohol. The last non-fiction novel is about an American who moves to Paris about ten years ago after tragedy hits at home. All are only adding fuel to the fire when it comes to me yearning for a Paris vacation, and after all isn't that exactly what books are for? Transforming you into their world. In this particular case, I am so there. I just can't help but get swept away by this lifetime and this lifestyle. When they talk about just up and moving to Paris in all three of these books I'm instantly excited for their adventure, while also being envious of course. I mean, who wouldn't want to live in Paris? Especially in the 1920s. From the top left going clockwise - Scott, Zelda and their daughter Scottie Fitzgerald. Hadley and Ernest Hemingway. Anonymous Flapper. Anonymous Model posing for Fashion Magazine. Ernest and Hadley skiing with their son Jack "Bumby" Hemingway. The Hemingway Family at the wedding of Ernest and Hadley. Zelda Fitzgerald. The last two are pictures of Parisian Cafes in the 1920s, the people are unidentifiable. I'm not nearly brave enough, nor would I necessarily want to move to Paris but the inspiration you can pull from this time period and from Paris in general is enough to make me swoon. It makes me think of reading all day over rosé in a outdoor café table while wearing buttery yellows and an off-white colored shift all while listening to an accordion and pondering over what I should eat next.... Doesn't that sound like heaven? I mean..... absolute HEAVEN. So basically I'm hoping for a Paris vacation soon. Or I suppose at the very least, a Paris themed movie marathon..... I'd prefer the former. However I do not think there is anything more romantic then Paris and with Valentine's Day around the corner, it might just be what I need to kick the winter blues for a couple more weeks. Hope your Valentine's Day is lovely!